Hot pink and sea green satin chiffon lehenga saree is enhanced with attractive pattern of resham embroidery, zari, lace and patch border work. It Included with matching designer blouse. 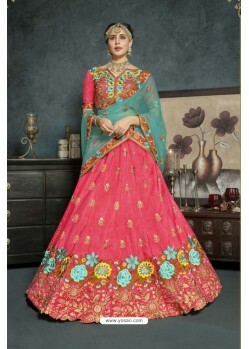 Its a pretty faux chiffon/Satin saree for wear on Festival and Reception. faux chiffon/Satin Fabric and Hot Pink/Sea Green color Zari and Patch Border used to make this stylish Saree.